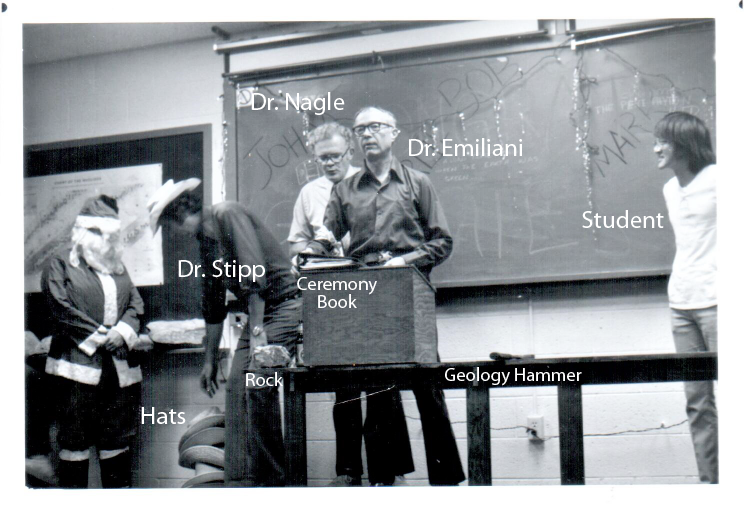 University of Miami geology department graduation ceremony circa 1979, led by Professors Emiliani, Nagle, and Stipp. My father, Cesare Emiliani (Dott., Ph.D), was a long-time chair of the Geology department at the University of Miami in Coral Gables Florida. He was a creative, outgoing, and fun person who applied his gifts to how the department would graduate its students. It was a separate ceremony that took place in a department classroom a week or so before the university held its official graduation ceremony. This peculiar graduation ceremony was no doubt invented in the campus bar (or a bar nearby such as Bill & Ted’s Tavern or Duffy’s Tavern), and took place from the mid-1970s through the 1980s. 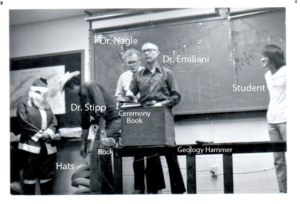 Below is the department graduation ceremony as recounted by a former geology student, Douglas Introne (edited slightly for clarity). To roast each student, you had to get to know them pretty well. This familiarity came about not just through classroom interaction, but in geology field trips, while dining together, and (especially) while drinking beers together and discussing geological science. There was a palpable respect for students, a collegial atmosphere between geology department faculty, staff, and students, a tremendous desire among the faculty for students to succeed in school and in their job after graduation. The department graduation ceremony evidences these special attributes of undergraduate studies in geology at the University of Miami during the time my father was department chair.